The stabbing death Sunday of a man near the northwest corner of Santa Monica Boulevard and La Brea Avenue has prompted complaints from area residents and a promise by the West Hollywood Sheriff’s Station to step up patrols in the area. Harker included in her email images of homeless people sleeping on the streets and of blood on the sidewalk where the as-yet-unidentified man was stabbed in the early hours of Sunday morning. Blood stains on the sidewalk after the stabbing on La Brea near Santa Monica Boulevard on Sunday. “This is our situation pictured below and it is getting worse, not better,” Harker said. “In light of yesterday’s tragedy and the fact that the suspect is still at-large, I will be meeting today with station command staff and others to discuss our plans on increased patrols of the east end (patrol personnel have already been directed to conduct increased patrols there). We know, residents have long been concerned about crime there. With yesterday’s murder I suspect there will be a new call for an increased law enforcement presence. It is not clear the man who was stabbed or his attacker were homeless. Detectives at the crime scene on Sunday morning said the man appeared to have been stabbed after an altercation near the McDonalds at 1133 N. La Brea Ave. just north of Santa Monica. 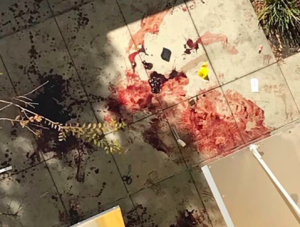 Someone at the scene later this morning told WEHOville that there was a blood trail from La Brea around the corner to Santa Monica Boulevard, and a pool of blood just outside the bus stop on the north west corner of Santa Monica and La Brea. The man was found on the sidewalk behind that bus stop, which is in in front of The Dylan apartment building at 7111 Santa Monica Blvd. Paramedics rushed the man to the hospital, where he was later pronounced dead, Bracks said. The suspect fled on foot in an unknown direction and the murder weapon has not been recovered. Sheriff’s homicide detectives have asked that anyone with information regarding the stabbing to call them at (323) 890-5500. You must have just moved here. 52 years born and raised RAMPANT! That corner is absolutely horrible. I lasted a few months in the Dylan before I broke my lease. That area is overrun by hookers, drug addicts, transients and the homeless. Nothing is being done. Rampant? Are you kidding me? Let’s not overreact, people. Some facts need to be disseminated before we can assign blame and seek solutions. Worse yet, to create a movement around it – along the lines of letting your emotions dictate bad laws – is premature and potentially dangerous. And another things – re regulating 24-hour markets. This is EXACTLY what I wrote in my first paragraph. If bars stay open until four, it’s the places that are open late which will attract customers. I don’t see anything resembling what Judy Mann said. Every time I am here, the commenters here appear to be a group of conservative reactionaries, chronic worriers, intolerant, and impatient, waiting for the enhanced police state to step in and save your butts. I don’t know how you can miss what Judy described. She sees it. I see it. And apparently there are a lot of others that see it. When you have lived in a city for 20+ years and you see it starting to decline in the last couple of years, you don’t wait until it hits rock bottom…you do something before it slides further south. Joshua: You might be either naive or lucky. As a patient, tolerant, non-reactionary, non-worrying, practical person who has traveled the world and can sense danger according to my inner calibration, I wouldn’t be foolish enough to venture out on the east side. I’m cautious and alert in my own center city hood and in Spaulding Square which seems the only quasi safe place to walk. The residents there are vigilant. A year and a half ago I stopped walking errands to the post office and Gelson’s because it just wasn’t smart or worth the risk, likewise Trader Joe’s at Sunset after dark. Most folks with their noses in their phones don’t notice what I’ve seen. Again perhaps they are lucky or naive. West Hollywood is slowly becoming intruded upon by the bad parts of LA proper and needs to take action to stump the causes of crime.One thing to consider is maybe its time to restrict the operating hours of such places as McDonald’s and 7-Eleven and its ilk.Places that are open 24 hours or sell low-cost food will attract the homeless or low-live characters. I see this all the time anywhere I go in the LA area. The gay district in Palm Springs (Arenas Road)had a similar problem with a Circle K shop where druggies and the homeless used to hang out in front of the entrance.Visitors would be bothered when walking by and you would see people sleeping on the steps.The shop lost its lease last year and in its place,a clothing shop opened.Since the change,I haven’t seen the strange people one bit.The nearby businesses and many patrons are glad the Circle K shop is gone. Having a baby, I walk down to Target from where we live near Fountain/La Brea several times a week. I’d say 90% of the time there is some sort of altercation going on between Ralph’s and the West Hollywood Gateway, the bulk of it from McDonald’s to the bus stop. It’s safe to say, things have very much spiraled out of control. Police never get there on time, if at all. Sad it takes a murder for officials to finally take some action. Not any better on the westside of WeHo. We used to feel same walking around at night. Not any more. We have bodies on sidewalk, in the back of buildings, in our parks, in our alleys, at our bus stops. What once felt like a very safe area no longer feels that way to us or our guests. And it appears to only be getting worse..not better. It always comes down to this ordeal with the homeless-doesn’t it?They’re a very belligerent bunch-they aren’t the meek that shall inherit the earth.I’m not at all certain that giving them free housing is going to solve the problem.This is West Hollywood-one of the most progressive cities in the world.Surely we can think of the right solution-the best solution.The solution that will actually work. Why are there no cameras either at McDonslalds or on the street corner. Hard to believe. There are cameras there, directly over the intersections,mounted above the traffic lights.As to MacDonald’s I don’t know. That’s crazy.That is probably one of the most dangerous intersections in the whole west side.Really bad crowd at that Target square. Agreed. The Public Safety Commission is going to have their regular meeting at Fiesta Hall in Plummer Park at 6:30 , Monday, March 12. Please attend and bring your neighbors. He’s right.That corner across from the Target square is a terrible spot.That square is a real drug haven-attracts addicts and pushers. A really bad crowd.